PLYMOUTH, MA – The United States Food Sovereignty Alliance (USFSA), an alliance of 37 organizations working for the right to food for all communities, is coordinating the Month of Community Power to Reclaim the Commons this October, which spotlights local communities’ resistance to the privatization of food, water, land, oceans, and the greater Commons.1 An estimated 20 actions are expected to take place across the United States, led by communities fighting for the rights to produce their own food and for the rights of food producers. The USFSA’s member organizations and allies believe that land and water are common resources that should benefit the people, especially to provide food for those most in need — not exploited for private profit or corporate gain. The Northwest Atlantic Marine Alliance (NAMA) will kick off the month of actions on September 30th, with a demonstration at the New England Fisheries Management Council meeting at the Radisson hotel in Plymouth, MA. This action will defend the ocean commons against policies of privatization and consolidation of shared resources. “In New England and elsewhere we believe that Main Street fisheries are better than Wall Street Fisheries. We know that farming policies driven by Wall Street have allowed for consolidation of our farmlands with grave ecological, social, and economic impacts. These policies are now being replicated in fisheries and it should stop,” said Ed Snell, a fisherman from Portland, ME and a member of NAMA. Throughout the month of October, groups across the country are taking action to the fight for their communities’ rights to access common resources and to participate directly in making the decisions about who controls our land, water, and food. In Philadelphia, a coalition of community gardeners, Soil Generation, is working to increase and to protect existing gardens in the city with over 30,000 vacant lots and is organizing community land access trainings during the Month of Action. In Montana, members of the National Family Farm Coalition (NFFC), representing 30,000 farmers throughout the country, organized a campaign to prevent a coal mine from displacing farmers and ranchers. In Alaska, the Salmon Beyond Borders campaign is organizing a petition to the US government to stop mining in Southeast Alaska that would destroy pristine fishing grounds in both the US and Canada. And in San Antonio, the Southwest Workers Union is continuing to organize low-income workers and families in the community around land and food at the Roots of Change organic community garden. The goal of the Month of Community Power is to amplify the voices of diverse community-based organizations and leaders from across the nation, working to put a stop to further resource grabs and privatization schemes. “Small farmers are only increasing. We aren’t going away,” says Chukou Thao of the National Hmong American Farmers, a member organization of NFFC. 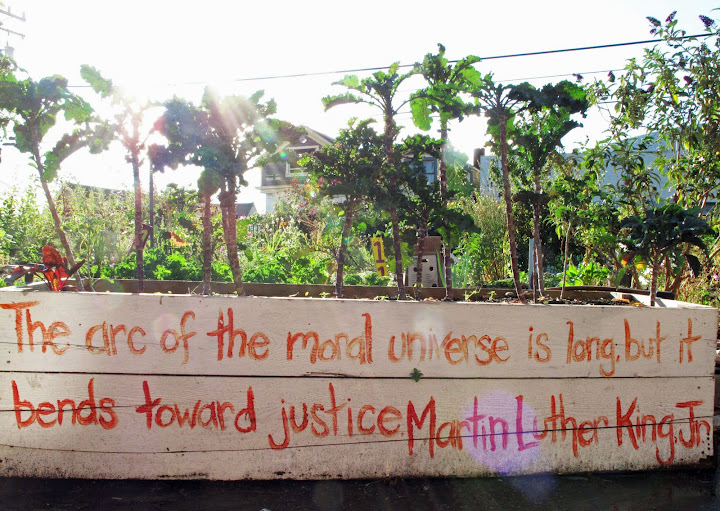 A full list of actions can be found at the US Food Sovereignty Alliance website (http://usfoodsovereigntyalliance.org/wfd2015/), and stories and updates from local organizations can be found at the Month of Community Power Facebook group (https://www.facebook.com/groups/MOCP15/). 1The Commons – land, water, seeds and open space – are being privatized at an alarming rate. Large-scale corporate entities and government policies are squeezing out community voice and input into the use of our most precious resources. Farmers are losing control over productive resources (land, water, seeds) and rights to save, exchange and share those resources; fishermen have increasingly limited access to the water; community gardens are cleared for expensive housing and commercial development projects; and farmers from other countries are often forced to migrate to the U.S. to work as food and farm workers. The damaging impact of privatization and resource consolidation in communities of color is an affront to human rights everywhere, and racism must be challenged through the movement to protect the commons. Connecting struggles seeking to change land and fisheries use and ownership is critical for building just and sustainable local food economies and ending hunger and poverty. This entry was posted in Land & Resource Grabs. Bookmark the permalink.